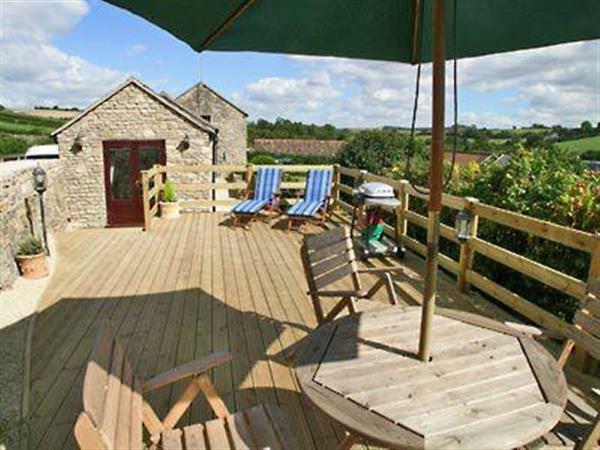 In a rural location this well presented semi-detached single storey stone cottage, with hot tub and availability of coarse fishing, is near the historic spa city of Bath (5 miles) and 11 miles from the lovely cathedral city of Wells, ideally located for exploring Somerset. and Pump Room, where visitors can sample the famous spa water or indulge in bath buns and coffee. Shop 2 miles, pub and restaurant 1 mile. All on ground floor: Living/dining room/kitchen with patio doors and wooden floor. 1 double bedroom (zip and link) with French doors. Bathroom with shower over corner Jacuzzi bath and toilet. Oil central heating, electric, bed linen and towels included. Travel cot. Satellite TV. DVD and small library. Stereo/CD. Electric cooker. Microwave. Washer/dryer. Freezer. Enclosed patio and furniture. Gas Barbeque. Parking (2 cars). Hot tub. No smoking please. Holidays at Paglinch Cottage run from Saturday to Saturday. For a better idea of where Paglinch Cottage is, you can see Paglinch Cottage on the map below. Paglinch Cottage is in Avon; should you be on the lookout for a special offer, you can find all the special offers in Avon. It's always worth checking to see what is on offer at the moment. Do you want to holiday near Paglinch Cottage (W41419), you can see other cottages within 25 miles of Paglinch Cottage; have a look to find your perfect holiday location.